At WLRN Television our mission is storytelling and we always have a number of original documentaries in production. As your only Storyteller Station, we are always on the look out for inspiring, educational and entertaining programs about the people and places in your community. Stories like OCEANS OF PINK, a documentary about how dragon boat racing has become a fast-growing sport among breast cancer survivors across Florida. Oceans of Pink highlights the rise in popularity of dragon boat racing among breast cancer survivors across Florida and the participation in the sport among Hispanic women. A sequel to two earlier WLRN documentaries about the birth of dragon boat racing in South Florida, the film follows the efforts of Miami boat leader Kim Bonomo, herself a survivor, to expand the movement with new teams throughout the state and her campaign to make Florida the host of the Fourth International Participatory Dragon Boat Festival. It’s an emotional journey that tells the stories of several Latina women diagnosed with advanced stage cancer and their desperate struggle for survival. Their stories speak to a widespread problem in the Hispanic population where women tend to seek breast mammography much later than other groups, which results in them being less likely to be diagnosed in the earliest stages of breast cancer. The stories build to the international race event in Sarasota, the first of its kind in the United States. Thousands of survivors from around the globe celebrate the sisterhood of dragon boaters, a community of support that is helping women overcome the challenges of cancer. Funding for OCEANS OF PINK provided in part by Miami Cancer Institute at Baptist Health South Florida and Marta S. Weeks. 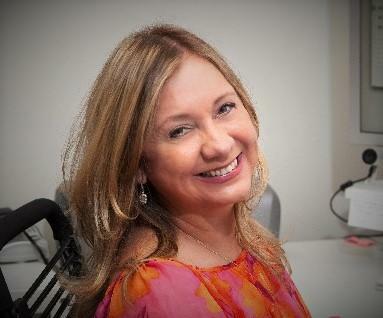 Shirley Ravachi is a Hispanic award-winning documentary producer and media communications professional. After her own diagnosis of breast cancer in 2007, she discovered a Miami dragon boat racing team for women with breast cancer, and she fell in love immediately with their mission and activities.Since then, she has been following the footsteps of the Miami team from its birth to its development as a competitive team, which gave birth to two documentaries: “All In The Same Boat: Stories of Breast Cancer Survivors” and “Conquering the Dragon, Breast Cancer Survivors Race for Life.” Both programs have aired on PBS stations across the United States and earned her two Silver Telly Awards and a NETA Award. Her third documentary “Oceans of Pink” explores the issues surrounding breast cancer in the Hispanic community and their increasing presence in the dragon boat movement.Ravachi received a Master of Arts in Media Communications from Barry University, Miami, in 1992, and a Bachelor of Arts in Communications from the Pontificia Universidad Javeriana in Bogotá, Colombia, in 1985. She was born in Barranquilla, Colombia where her parents still live.